The Decorated Apparel Showcase is a stage located inside the lobby area dedicated to demonstrations and education. All sesions are sponsored by industry suppliers, and are FREE to all DAX attendees. No tickets required, just come be our guest. Sessions start every hour and cover things that are new in the industry or procedures for using cutting edge technology. Check out the schedule below and make plans to sit in on a free session while you are at DAX. A session for beginners and experts. Learn the best tips and tricks for heat transfer applications. 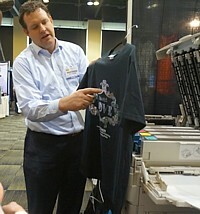 Topics will include plotter cutting, print & cut and screen printing discussion.